A natural herbal concentrate for the stimulation of Wood-element organ function within the Energyvet Pentagram scheme. It acts through a mild excitation of the liver, gall bladder, fat metabolism and joints, stimulating these organs or tissues towards increased activity. It generally optimises the animal's metabolism. Bio-information of the product-specific homeopathic type complements and potentiates the effect of the included herbs. It stimulates the function of organs and tissues of the following element of Fire, i.e. of the heart, vascular system, hormonal system, and the small intestine. The product calms down excessive energy and hyperactivity of the previous element, Water, i.e. the kidneys, lymphatic system, immune system (inflammatory tissue), urinary tract, and sexual organs. - Modification of the energy metabolism, protein metabolism, enzyme activation [Probiovet]. - Digestive problems (except for gall bladder and liver) [Cytovet, Probiovet]. - For intoxications with organophosphates, organic poisons [Cytovet]. - For painful hair, painful reaction to touch [Fytovet]. - The heart in cases of weakened heart, wall thinning, enlarged chambers [Skelevet]. - The production of hormones [Omegavet]. - Digestion in cases of either weight loss or weight gains [Omegavet]. - Insufficient production of digestive enzymes [Fytovet]. - Fatigue or shortness of breath during exercise [Omegavet, Fytovet]. - Excessive urination in cases of kidney failure [Probiovet]. - Signs of inflammation affecting any organ (fever, pain, oedema, loss of function) [Skelevet]. - Inflammations of the veins, vasculitis [Imunovet]. - Painful inflammations of the lymphatic nodes and lymphatic vessels [Skelevet, Imunovet]. - Acute inflammations of the womb, prostate, urinary and sexual tract [Imunovet, Omegavet]. - Allergic conditions (alternatively with Renovet) [Imunovet]. - Conjunctivitis [Cytovet – diluted]. - Helps to reduce tumour growth in connective tissues (sarcomas) [Cytovet, Imunovet]. - Calms down fearfulness and pathological fear [Fytovet]. Herbal extract 82.6% (Potentilla erecta, Taraxacum officinale, Plantago lanceolata, Veronica officinalis, Chelidonium majus, Pimpinella saxifraga, Zanthoxylum piperitum, Artemisia abrotanum, Gentiana lutea, Marrubium vulgare, Agrimonia eupatoria, Galium verum, Saxifraga granulata), sorbitol – thickener, microcrystalline cellulose – thickener, water, xanthan – thickener, grapefruit extract – preservative, potassium sorbate – preservative, mix of essential oils 0.12%, silymarine 0.10%, bioinformation for Regavet. Shake well before use! In cases of suspected liver tissue or gall bladder impairment limit administration to two days only. If no negative reactions arise in the following 3 days, continue to administer for up to 3 weeks. Do not administer in cases of liver or gall bladder impairment. Do not exceed the recommended daily dose! Ensure sufficient intake of water in the course of product usage. Not suitable for gestating females. Keep out of reach of children! Do not administer concurrently with Renovet or Kingvet or without at least a one-week break from therapy with these products. 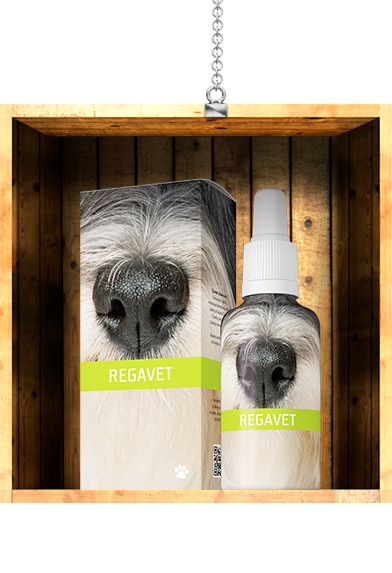 Regavet is excellent for digestive and metabolic problems. It is highly efficient in the treatment of kidney failure, particularly in carnivores. It has also an indispensable place in the treatment of allergic conditions (I alternate the product with Renovet after 4 weeks).